This post is part of a compensated campaign in collaboration with California Sweetpotatoes and Latina Bloggers Connect. All opinions and the recipe are my own. 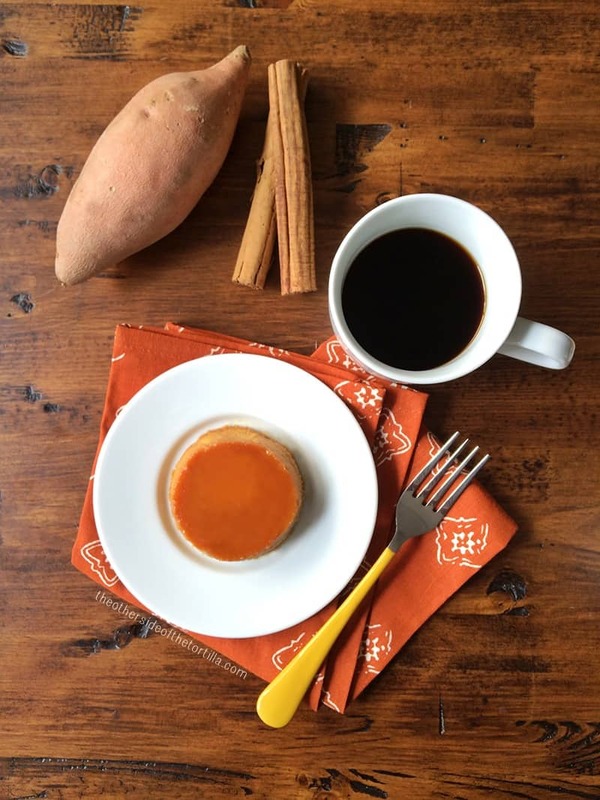 Sweet potato flan is a non-traditional flavor for a very traditional dessert, but if you’re a sweet potato fan, I guarantee you’ll like this rich, decadent dessert. Mashed sweet potato gives this recipe a more dense, textured quality than your traditional flan. I like cooking with sweet potatoes because they can be prepared in a variety of ways from savory to sweet. This low-carb and vitamin and mineral-rich vegetable is considered a superfood and one sweet potato contains more than one day’s worth of Vitamin A. My favorite way to eat them is baked and sprinkled with a little chopped piloncillo, ground cinnamon and a little bit of butter, which is what led to the idea to create this flan recipe…. Carlota de limón is an excellent, easy dessert served during Easter and Christmas holidays, as well as during the spring and summer. A Carlota, also known as a Charlotte in English, is an ice-box cake. That is, it includes a filling layered with cookies that needs to be frozen in order to get the right consistency–almost ice cream-like. I consulted my cuñada as to what she knew about carlotas, but apparently not everyone calls them by that name. She told me she often sees the dessert simply called postre de limón in Mexico City. No matter what it’s called, though, we decided it was delicious and the perfect dessert to share with family and friends. This past weekend, I was trying to decide what I should bring for dessert to my family’s Easter fiesta. I was considering taking either flan or capirotada, but couldn’t decide so I asked Twitter what to do. I got just about equal votes for each, including one really funny comment after I referred to our gathering as “Mexi-Rican Easter” since we’ve got some Puerto Rican cousins in my extended family on my stepmother’s side. Eventually, my friend Nelda suggested I bring a carlota. We debated a bit about the method and the kind of cookie to be used (ladyfingers versus galletas María), but ultimately we decided the best version would include cream cheese. I can’t remember the last time I had a carlota, but I’ll tell you what: It’s making a comeback in my kitchen this spring and summer. In fact, my carlota de limón was such a hit that my diabetic abuelita gobbled up two servings and begged for a third. Sadly, we had to tell her no so she wouldn’t get sick. But she wasn’t the only one in love–the whole thing was devoured in about five minutes flat. Carlotas can be made with all different kinds of fruits. My favorite kind uses lime juice, but feel free to try other fruit juices or purees. I will say, though, that citrus juices will thicken the filling slightly better than other fruit juices or purees. How to make a Carlota de limón (postre de limón). 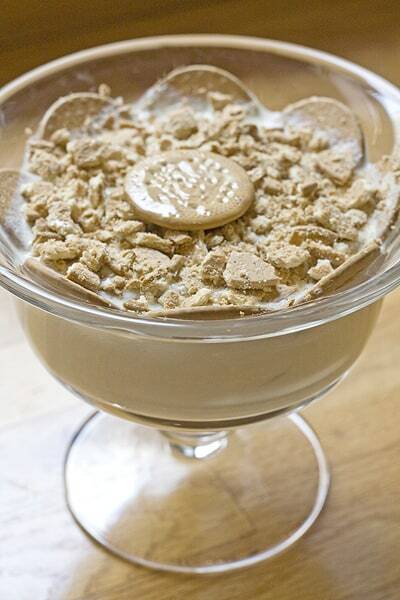 This Mexican icebox cake is also known as a Charlotte in English. First, juice enough limes to yield 1 to 1 ¼ cup juice–about 10 to 12 limes (more if you use smaller key limes). Set juice aside. In the stand mixer bowl (or a glass bowl if using a handheld mixer), add the sweetened condensed milk, evaporated milk and whipped cream cheese until smooth. Mixture will be somewhat soupy because of the liquid evaporated milk. Slowly add the lime juice while stirring. Mixture will begin to thicken. Add the lime zest. Blend until lime juice and zest are completely incorporated. Cover and refrigerate. In a small saucepan, heat the granulated cane sugar and water until it becomes a light amber syrup. Remove from heat and let cool slightly. Line a cookie sheet with wax or parchment paper and place the galletas María in rows on the sheet. 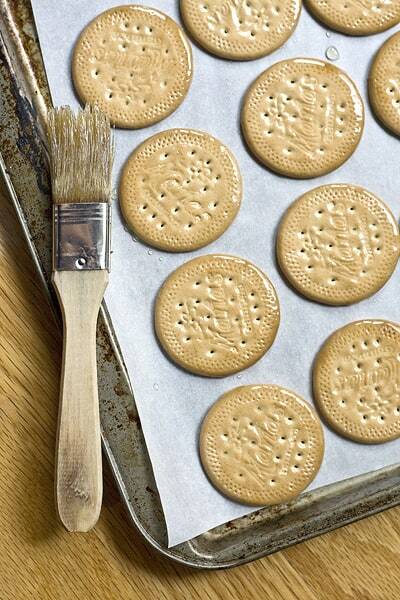 Using a pastry brush or the back of a spoon, lightly coat the tops of the cookies with the syrup. This will seal them a little and prevent them from getting too soggy before the filling gets cold enough in the freezer. When the cookie tops have dried, flip them over and brush the other side. You’ll have a little bit of glaze left over, which you can use for something else or discard. 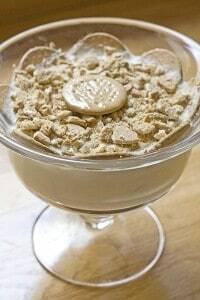 When the cookies have dried completely, line the bottom and sides of your trifle or casserole dish with whole cookies. Remove the filling from the refrigerator and pour some over the bottom layer of cookies, being careful not to drown the cookies on the sides. Use a spatula to even out the filling if necessary. You’ll layer cookies & filling until you reach the top of your dish. You can either use whole cookies or, as I sometimes like to do, coarsely crush the cookies for the middle layers. For the top layer, I like to use crushed cookies with one whole cookie placed in the center. Carefully place your dish into the freezer and allow it to set for at least two hours. If you use individual-sized dishes, you may need less time in the freezer, and if you use a deep dish like a trifle dish (as shown above), you may need more than two hours. It’s also fine to leave in the freezer overnight if you want to make it the day before you plan to serve the dessert. The ideal consistency will be like an ice cream cake. Remove the dish from the freezer about five to 10 minutes to soften slightly before serving.